I have been using Real Trim II for less than a week and I can really tell a difference. I am working out up to two hours a day and still do not have much of an appetite. After taking it I feel strong and want to work out harder and longer. I am excited to see the results with ongoing use. Multiply your weight in pounds by 703, then divide the result by your height in inches, and divide that result by your height in inches a second time. A BMI from 18.5 up to 25 is considered in the healthy range, from 25 up to 30 is overweight, and 30 or higher is obese. This product contains hundreds of MicroEnergy® induced frequencies to support weight loss and wellness. Emotional Issues: Emotions play a critical part in our weight management. Fat acts a protection emotionally. If we feel unloved, unworthy, abandoned or similar "ugly" feelings at a deep emotional level, our bodies respond by creating an image of us to the world that is "ugly". It literally retains fat to protect us from people so they will not get too close to us. emotionally. Toxic Overload: When our bodies are exposed to toxins (heavy metals, lead, mercury, arsenic, pesticides, benzene, isopropyl alcohol, etc.) it stores these toxins in our fat tissue to keep them safely away from vital organs. This is nature's way of protecting you. However, when we try to lose weight, and toxins are released from the fat cells, this is potentially dangerous to the body's organs. This is why some of us will do every thing right to lose weight but it just does not come or stay off - we gain it right back. The body is really trying to protect your health by creating a dumping ground with your body's fat cells. Incorrect Eating: Correct eating is important to truly keep the weight off. White flour, sugar, sodas most fast foods and snack foods are energy robbers of the body. These foods are "empty" calories. They do not satisfy the body's need for vital nutrients. As a result, the body continues to send a hunger signal wanting the vitamins, minerals, enzymes, proteins, etc. it is needing. We often respond with even more empty caloric foods, literally starving the body of building nutrients and providing it excessive fat producing and energy robbing fillers. Acidic pH Levels: Nature can play a trick on us. Throughout history when a famine would occur, the pH in mankind's bodies would go down triggering a survival response in our bodies. When this occurred, our bodies instinctively held onto ever thing we ate and stored it as fat. This was a practical way to make it through the famine. In modern times we are a very acidic people due to our diets and stress. Our bodies think it means famine so it holds onto the fat and won't lose it no matter how hard we try. Lack of Exercise: You have to burn more calories than you eat to lose weight. There is no other way. Exercise is a key component, but when we are struggling with emotional stress our body's block the motivation to exercise. As a result, we stagnate and continue the downward cycle. Less exercise breeds even less energy to break this cycle. Slow Metabolism: Slow metabolism or a low functioning thyroid can cause weight issues. As our metabolism slows, it is more and more difficult to burn the same number of calories. We either have to exert more to achieve the same results or our bodies simply store more fat. 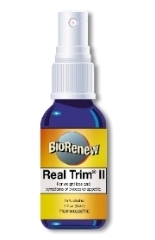 Real Trim® contains a unique formulation of homeopathic supportives with no stimulants. This rare combination of ingredients were formulated using sophisticated biofeedback equipment to address each of these six factors of weight gain. Real Trim® contains Emotional Support, Detoxifiers, Appetite Control, pH Balancers, Natural Energizers, Metabolism and Thyroid Support. Real Trim® is produced in the United States in an FDA certified laboratory following US Homeopathic Pharmacopoeia guidelines. To guarantee maximum bio-activity and absorption into the body, all BioRenew products are fully hand-succussed. All BioRenew products are meticulously tested to assure bio-availability through absorption and assimilation. Further our product are tested to assure ZERO stress is produced in the body from any of our ingredients. Thus, we are able to ensure the integrity of all our products. INGREDIENTS: Capsicum Annuum 3x, 6x, 12x, 30x, 200x. Ferrum Metallicum 3x, 6x, 12x, 30x, 200x. Natrum Sulphuricum 3x, 6x, 12x, 30x, 200x. Pulsatilla 3x, 6x, 12x, 30x, 200x. Graphites 3x, 6x, 12x, 30x, 200x. Calcarea Carbonica 3x, 6x, 12x, 30x, 200x. Thyroxine 6x. Iodium 6x. Usage: 2 sprays under tongue 3 times/day 10 minutes or more away from food or drink.